On Sunday, FSN continued its broadcast of the World Poker Tour’s ninth season with Part II of the L.A. Poker Classic. A staple of the WPT circuit dating back to Season One, the LAPC drew 681 players, creating a prize pool of $6,537,600, making it the largest of Season IX up to that point. 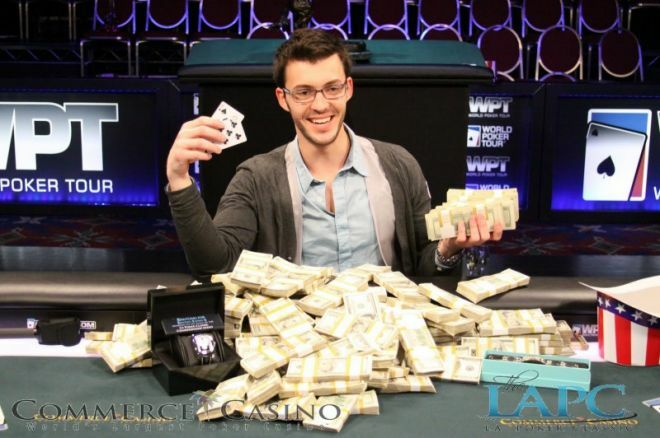 All the players were hopeful of following in the steps of Gus Hansen, Antonio Esfandiari, Michael Mizrachi, and Phil Ivey in becoming a WPT LAPC Champion, but there could only be one. If you recall, last week’s episode, which is recapped in Part I, saw the elimination of Darryll Fish in sixth place for $235,250 after his ran into Carlos “The Matador” Mortensen's . Fish was followed out the door by a short-stacked Steve Gross in fifth place when Vivek Rajkumer's held against Gross' on a board. Gross took home $304,000 and ended the broadcast with four players remaining. Here is how the final table stacked up at the top of the episode. First Hand: Amir Lehavot looked down at on the button and raised to 175,000. Vivek Rajkumar then looked at and decided to slow-play with a limp. When the flop fell , Rajkumar checked, Lehavot continuation-bet 235,000, and Rajkumar check-raised enough to put his opponent all-in. Lehavot did not look too happy but declared that he was pot-committed before making the call. Rajkumar was a 73 percent favorite, which improved to 85 percent when the dealer burned and turned the . Lehavot needed a king or ten on the river to stay alive, which meant the would be the last card he would see in the LAPC. Lehavot was eliminated from the tournament in fourth place worth $421,680. Lacking Aggression: After donning his sunglasses, Carlos Mortensen put in a raise to 250,000 holding . Action folded to Gregory Brooks who picked up . He thought long and hard before just calling. Brooks proceeded to check the flop, opening the door for Mortensen to bet 350,000. Brooks took a moment before slowly sliding his cards in the muck. Costly Call by Mortensen: Gregory Brooks raised to 210,000 holding and received a call from the of Carlos Mortensen in the small blind. The flop gave both players a pair, but the action still went check-check. The gave Mortensen a straight draw to go along with his jacks, inspiring him to feel out the situation with an 85,000 bet. Brooks called with his aces and watched as the spiked on the river. Mortensen bet another 85,000 into the pot of 700,000. Brooks sprung into action with his rivered two pair by making it 800,000 to go. Mortensen stared down his opponent before making the call. “Two pair,” Brooks said as he revealed his hand for the win. WPT Legend Falls: Carlos Mortensen raised to 200,000 on the button holding and received calls from the of Vivek Rajkumar in the small blind and the of Gregory Brooks in the big. The flop certainly delivered, pairing Mortensen but giving Brooks a huge drawing hand. In fact, it was Brooks who bet 380,000 after Rajkumer checked. Mortensen shuffled some chips before moving it up to 800,000, which prompted Rajkumar to fold. Brooks stared down the former world champ before announcing "all-in." “Call,” Mortensen snapped, only to discover that Brooks was a 56 percent favorite to win the hand. The turn put Mortensen back in the lead, but the gave Brooks the flush and sent the Matador home in third place ($640,680), shy of his fourth WPT title. The Raw Deal: In this week’s edition of The Raw Deal, Tony Dunst analyzed the Gregory Brooks/Carlos Mortensen battle that led to the 2001 World Series of Poker Main Event Champion’s elimination. Dunst highlighted Mortensen’s “blocking bets” and the quandary Brooks presented to his opponent. “Even the best get picked off on first base on occasion,” host Mike Sexton commented after the segment. Rajkumar Makes a Big Call: Holding , Gregory Brooks raised to 230,000 only to have Vivek Rajkumar make it 720,000 with . Brooks called the additional 590,000 and watched as the flop gave him another straight and flush draw, making him a 71 percent favorite. Rajkumar check-called a bet of 540,000 and then checked in the dark. The was delivered on the turn and Brooks simply moved all-in. Rajkumar immediately flinched and let out a long sigh. While he was ahead, he was only a 52 percent favorite, making it a coin flip — if he were to call. Amazingly, that's what Rajkumar did. When he discovered the situation, he made his way to his buddies on the rail and watched as the fell harmlessly on the river, giving him the 9,060,000 pot. More Heads-Up Action: With the blinds at 50,000/100,000 with a 10,000 ante, Gregory Brooks was still out in front with 11,770,000 chips to Vivek Rajkumar’s 8,660,000. Brooks began the long and arduous process of recouping chips and was helped when he flopped a flush holding against Rajkumar’s . The two ended up creating a pot worth 8,070,000 as the board ran out . In the last hand of the tournament, Brooks raised to 325,000 on the button with . Rajkumar looked him up from the big blind holding , making him a 67 percent favorite. However, Brooks managed to out-flop his opponent when the flop fell . Rajkumar checked, Brooks fired out 400,000, Rajkumar moved all-in for 3,575,000 total, and Brooks made the call. Rajkumar stood only a 28 percent chance of winning the hand and sought support from his rail (which consisted of Randal Flowers, Matt Affleck, and Darryll Fish — to name a few). The turn meant that Rajkumar needed a jack or ten on the river to stay alive. The crowd was on its feet and shouting for various cards as the dealer put out the , putting an end to the LAPC. Rajkumar’s runner-up finish earned him $908,730 while Brooks took down his first WPT title and the accompanying $1,654,120 prize. Tune in Next Week: FSN will continue its broadcast of the WPT Season IX next Sunday, so be sure to either check your local listings or visit PokerNews for the recap.